Detail Trypsin is a serine protease that specifically cleaves at the carboxylic side of lysine and arginine residues. The stringent specificity of trypsin is essential for protein identification. Native trypsin is subject to autolysis, generating pseudotrypsin, which exhibits a broadened specificity including a chymotrypsin-like activity. Such autolysis products, present in a trypsin preparation, would result in additional peptide fragments that could interfere with database analysis of the mass of fragments detected by mass spectrometry. 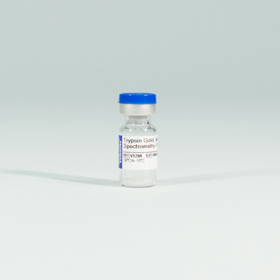 Trypsin Gold, Mass Spectrometry Grade, has been manufactured to provide maximum specificity. Lysine residues in the porcine trypsin have been modified by reductive methylation, yielding a highly active and stable molecule that is extremely resistant to autolytic digestion. The specificity of the purified trypsin is further improved by TPCK treatment, which inactivates chymotrypsin. The treated trypsin is then purified by affinity chromatography and lyophilized to yield Trypsin Gold, Mass Spectrometry Grade. It is resistant to mild denaturing conditions such as 0.1% SDS, 1M urea or 10% acetonitrile and retains 50% of its activity in 2M guanidine HCl. The activity of trypsin is decreased when acidic residues are present on either side of a susceptible bond. If proline is at the carboxylic side of lysine or arginine, the bond is almost completely resistant to cleavage. Each lot of quality-tested Trypsin Gold, Mass Spectrometry Grade, is qualified for use with in-gel digestion and mass spectrometric analysis.